Monday February 8- 1932 I had rather a good day Hattie & Mrs Gay out to The House for luncheon. Mrs Frankie [Pimtain?] here for a call in PM. Ott here at 5-oclock Hattie went home with Rob at supper time and later to play cards at Miss Sweeneys home. I read some. Tuesday, February 9- 1932. Not so well today Letters from Mrs Wade & Winnie I rested awhile in PM. Ott here as usual. I read to Hattie some. I wrote Lois Reeves & wrote to Mrs Barber. Wednesday, February 10- 1932 Tishie Hedges here in AM. Hattie went uptown I got our dinner. Letters from Laura & Sister Ida. I wrote to LeGrand in the afternoon sent Valentine to Teddy Cox Rob took Hattie & me home with him to supper Such a nice day. 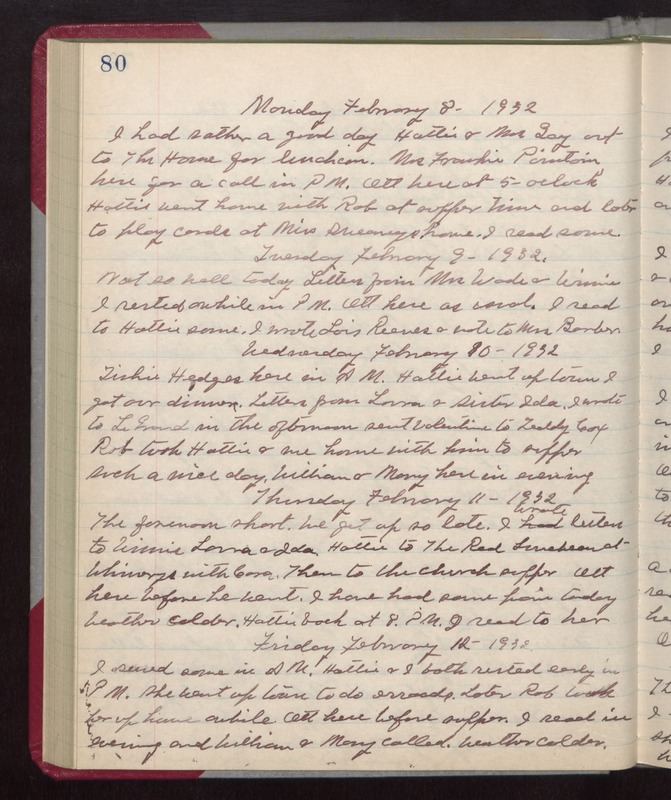 William & Mary here in evening Thursday February 11- 1932 The forenoon short. We got up so late. I wrote letters to Winnie Laura & Ida. Hattie to The Red Luncheon at Whinerys with Cora. Then to the church supper Ott here before he went. I have had some pain today Weather colder. Hattie back at 8. PM. I read to her Friday February 12- 1932. I sewed some in AM. Hattie & I both rested early in PM. She went up town to do errands. Later Rob took her up home a while. Ott here before supper. I read in evening and William & Mary called. Weather colder.